Well, I didn’t exactly catch up on sleep last night. I slept snug as a bug in my cozy covers for about 3 hours until Daniel got out of bed at 2:00am to check on a noise coming from the front room. When I saw him peer around the frame of our bedroom door, as if to look for an intruder, I went from drowsy to completely alert. Awake, I began to notice my bladder and just as I was about to get out of bed to use the bathroom (after I realized my life wasn’t threatened of course), I saw Daniel drop down on all fours. I was totally confused but proceeded to the bathroom just in time to watch a RAT sprint from the living room to the second bedroom. Yes, a freaking RAT!! Lovely. A couple months ago we had a bit of a mouse problem. By that I mean we caught five of them. We let the first couple free, but I am pretty sure they came right back inside. Sorry pals, limit one trip per customer. Apparently mice are the price we pay for living by the ocean, a river, and the disgusting septic tank just outside our lanai. Everyone I mentioned our mice to would say something comforting like, “oh yeah, there are rats everywhere up there, you can’t avoid them” or “yeah, my friend at rats thiiissss bigggg last year.” Thanks for your support, people! Humph. Field mice are one thing (disgusting), but rats make cleaning out a turkey seem pleasant. I don’t have picture of last night’s hideous house guest because it didn’t stick around long enough for a photoshoot. Instead, it leaped onto our office chair, scurried across our desk, jumped to the window sill and shimmied through the screen to the cold outside (THANK GOD). Imagine a seven inch long rodent doing somersaults across your keyboard. This was my reaction …. 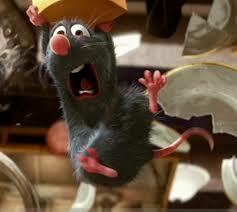 Perhaps it was Ratatouille just coming to help me with my Thanksgiving preparations. I could use another set of hands, but I’m just not so sure where Mr. Rat’s have been. Better safe than sorry. Thankfully I have an awesome husband who disinfected almost the entire day while I was at work. Lifesaver!!! !